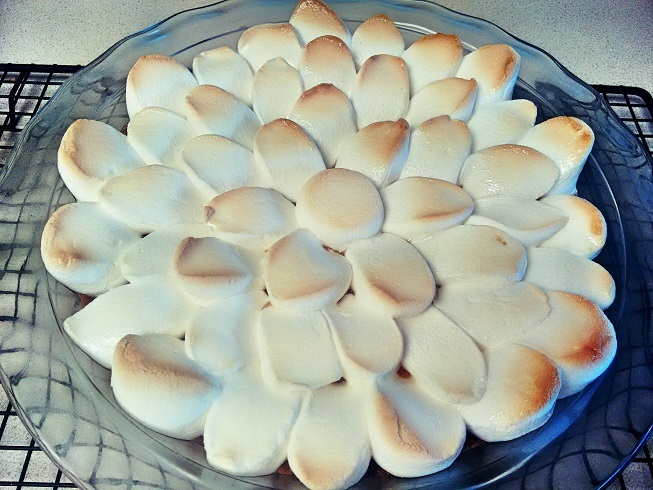 This pie doesn't necessarily fit in with the other dessert recipes on this blog, because I didn't make any effort whatsoever to reduce the saturated fat or sugar. I made it for my boyfriend's daughter's birthday party, and it was a hit with our 11 year old guests! 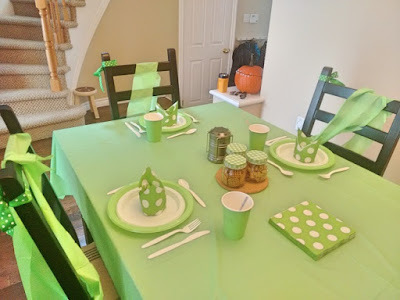 We had an (indoor) camping themed birthday party, for which we decorated the dining table in green complete with a camping lantern, mason jars labelled "Squirrel feed" for nuts, "Don't feed the bears" for pretzels, and "Catch of the day" for Goldfish crackers. Of course, I had to put my mad napkin folding skills to use to make the Bishop's hat. I knew working on a cruise ship would pay off someday! The seating area had sleeping bags and pillows spread out on the floor. The kids played camping themed Pictionary on a white board, made friendship bracelets and listened to ghost stories (this podcast is just awesome, so even if you're not having a party, it's a great listen). Anyway, back to the pie: It is fairly easy to make, but it is time consuming, because each layer has to set before you can add the next layer. You can have all the layers ready and place it in the refrigerator the night before, so all you have to do the day of the party is toast the marshmallows. I had never made a graham cracker crust before, so I wasn't really sure if I should bake it or refrigerate it before adding the ganache. 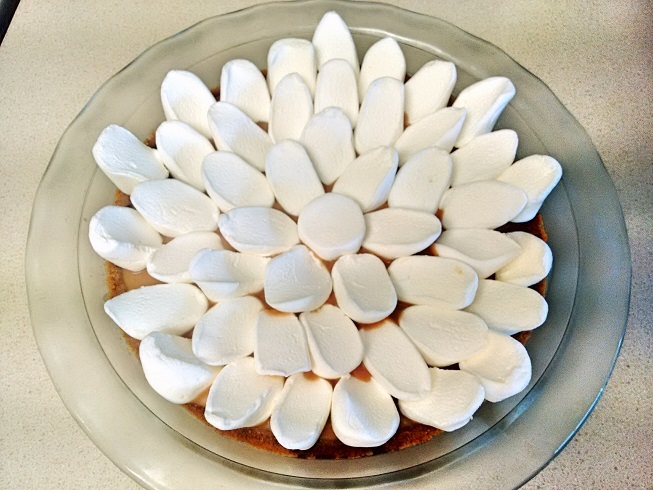 I decided to bake it, which made it shrink a little, which I googled afterward to see what I did wrong--from what I read, it is not recommended to use a glass pie dish for a graham cracker crust because it will slide down the sides during baking. My mistake actually turned out just fine, because the marshmallow layer covered it anyway. You can, of course, just use a pre-packaged graham cracker crust. Mix honey graham crumbs and butter in a large bowl. Press firmly into pie pan, evenly covering the bottom and sides of the pan. Bake at 300°F for about 8 minutes. Allow to cool fully before adding the next layer. Break chocolate up into pieces and place in a glass casserole dish that has a lid. Pour whipping cream into a small saucepan and set heat to low. Stir occasionally, and watch the cream carefully. When it comes to a simmer, pour the cream into the casserole dish to fully coat the chocolate pieces. Place the lid on the casserole dish and set a timer to 5 minutes. After 5 minutes, remove the lid and lightly whisk from the centre outward. The chocolate will melt and the ganache will begin to thicken. Once the mixture is uniform, spoon or pour the ganache carefully into the graham cracker pie crust, and spread evenly using the back of a spoon. Allow to cool on the countertop for at least 15 minutes, then refrigerate to set for 30 minutes. Place peanut butter chips in a glass casserole dish with a lid and repeat the procedure used above for the chocolate ganache. Allow to set, but do not refrigerate. 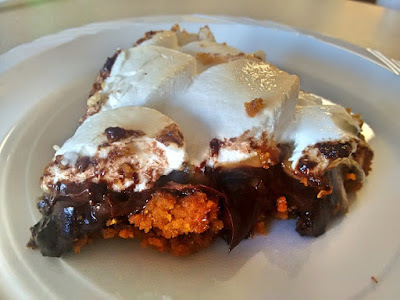 The peanut butter ganache should still be slightly sticky when adding the marshmallow topping. Cover with tin foil and refrigerate the pie until about 30 minutes before serving. Set your oven to broil. Uncover the pie and place in the oven. Rotate the pie every minute to make sure that it is evenly toasted. To lightly toast the marshmallows, it will take about 8 to 10 minutes. Remove from the oven and allow to return to room temperature before serving, about 20 minutes.